Loyola University New Orleans will open its doors to students’ family and friends for the university’s annual Family Weekend to be held Sept. 30 - Oct. 2. 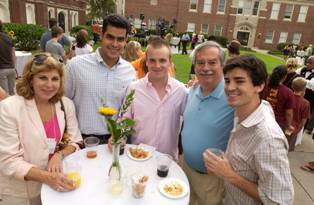 Family Weekend allows students and families to reconnect after the beginning of a new academic year, and enables families to experience Loyola as their loved ones do. Shadow Your Student to Class. Experience Loyola academics by accompanying students through their class schedule. The Tastes & Sounds of HBO's “Treme.” Music by D.J. Davis Rogan and His Band with food by Boucherie’s Purple Truck on Loyola’s Peace Quad, as part of NolaLoyola 2011: Live to Eat, sponsored by the Center for the Study of New Orleans. Daily and Vigil Mass. Join members of the Loyola community to celebrate a daily mass in St. Ignatius Chapel on Friday, and a Saturday vigil mass in Holy Name of Jesus Church. Study Abroad Fair. Meet Loyola faculty who host study abroad programs and learn about exciting cultural programs. Fun, Facts and Fables. Learn about three centuries of life in the Big Easy as a professional guide leads you on a memorable bus tour through historic New Orleans. Advising Roundtable. Meet with faculty and staff advisers to hear about hot topics on campus and answer any questions about students’ academic experience. PRISM Concert. View Loyola’s major musical ensembles in Roussel Hall, presented by the College of Music and Fine Arts. NolaLoyola 2011: Live to Eat. “New Orleans on a Plate: A Conversation about Legendary Fare,” featuring Ti Martin of Commander’s Palace, Leah Chase of Dooky Chase and JoAnn Clevenger of Upperline, sponsored by the Center for the Study of New Orleans. The event-filled weekend will conclude on Sunday at 10 a.m. with a farewell brunch featuring a jazz band. To view the entire schedule or to register for the weekend, visit Loyola’s Family Weekend website. Registration is required. Students and children under 6 are free. Registration for children ages 7-12 costs $20, and all other family/friends ages 13 and up cost $75 per person for the entire weekend. For more information on Family Weekend, contact Seth Hagler, assistant director of Residential Life, at 504-865-2445 or reslife@loyno.edu.